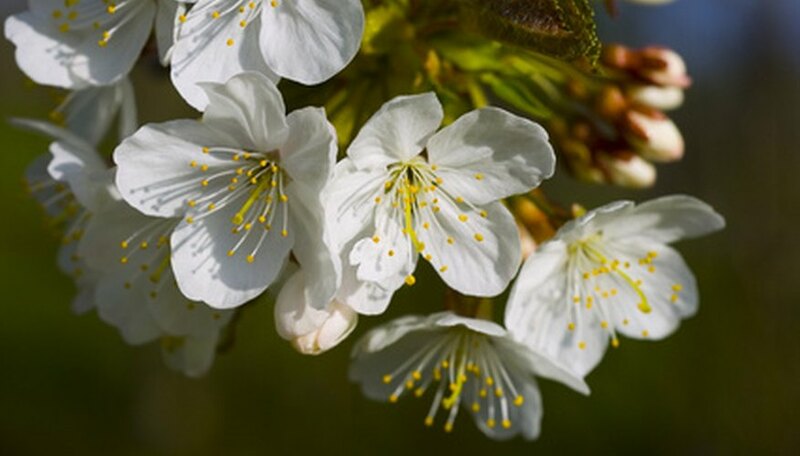 Dwarf cherry trees are the tree of choice for home gardeners who don’t own cherry pickers or other equipment for harvesting fruit from tall trees. Your success in growing a dwarf cherry tree depends on purchasing a tree that is adapted to environmental conditions in your area as well as preparing a bed to plant it in that will allow the tree to thrive and giving the tree proper care and pest management. Choose a location for your trees in full sun and well drained soil. Test your soil to determine the pH level. To do so, collect a soil sample by digging 1 quart of soil from up to 10 locations in your orchard or yard. Mix the soil in a bucket and allow it to dry. Then place 1 cup of soil in a plastic bag and take the soil to a soil laboratory for testing. Results for a soil lab test are typically returned within three weeks. Break up your soil in your landscape or orchard to a depth of 12 inches with a rototiller. Spread soil amendments over your soil in a 4-inch-deep layer based on the test results from the test in Step 1. Most soils benefit from soil amendments that include organic materials such as compost and peat moss as well as sulfur to lower the pH of soil or lime to raise the pH. Most cherry trees grow well in a soil pH between 6.2 and 6.8. Mix these amendments into your soil with a rototiller. Select a cherry tree variety that is adapted to your local growing conditions. Most cherry trees do not grow well in the south due to the long hot summers and mild winters found in southern states. Cherry trees require a chilling period over the winter to produce fruit buds. However, most cherry trees also do not do well in extreme northern climates where temperatures in winter dip below -20 degrees F. Purchase trees from local nurseries wherever possible. Locally grown trees are better adapted to local growing conditions and are more pest and disease resistant. Sour cherry trees are self-fruitful, but sweet cherry trees should be planted in groupings of two or more to cross-pollinate. Open a planting hole for your cherry tree by digging a hole that is twice as wide, but no deeper than the cherry tree’s root ball. Place the tree’s root ball in the ground and fill in around the root ball with soil. Water trees with 1 inch of water every 10 days. Cherry trees especially need water to produce plump cherries. Train cherry trees into an open-center system, which resembles an umbrella rather than a Christmas tree in form. Remove all but the strongest four branches from a single point. These branches will develop fruit-bearing side shoots. Each branch should be spaced 90 degrees from its neighbor, and each should point in a different direction, like rays on a compass. The best season to prune cherry trees is in early spring while the tree is still dormant. Cherry trees will recover from pruning faster and are more resistant to insects and disease if pruned during this time. Prune away water spouts, which are short, weak, upward-growing branches. You should also remove suckers, which are tiny trees that grow from the roots or soil line of the cherry tree. Prune off any broken or diseased branches as well. Cover your trees during fruit season with netting to prevent birds from taking the fruit. Many agricultural universities operate soil laboratories for the purpose of testing soil for farmers and gardeners. You can access these soil laboratories through your local county extension service. Tracy Morris has been a freelance writer since 2000. She has published novels and numerous online articles. Her work has appeared in national magazines and newspapers including "Ferrets," "CatFancy," "Lexington Herald Leader" and "The Tulsa World." She holds a Bachelor of Arts in journalism from the University of Arkansas.